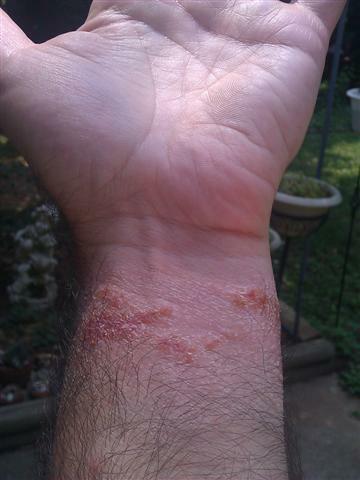 The poison ivy got me. I put on gloves and went to war, pulling it up by the roots, yanking it up and breaking it off with reckless abandon. I’ve beaten it. It no longer lurks in the shrubs, waiting to ambush a hapless victim, but it didn’t go down without a fight. It’s left me wounded, struggling with itchy blisters around my wrist. Last Monday I pulled up the poison ivy vines and threw them over the back fence. They have probably long since withered in the hot June sun, but I’m still scratching and suffering because my gloves and my sleeves didn’t meet. The gloves didn’t cover enough. I was too careless. Too confident. The first day or so after the event, I was fine. I thought I had gotten away with it. All the while, the poison was working it’s way into my skin. Now I’m paying the price and the evidence is clear to see. This whole affair reminds me a little of another affair that has been in the news lately. A past presidential candidate played with the poison and thought he got away with it . . . for a while. Now the ugly mess is spread all over him. Sooner or later, it always does. It pops out and leaves a person miserable. There is only one cure. It occurred to me this Sunday. I was walking down the aisle to take communion. I looked at my ugly sores and thought how wonderful it would be to just wash away the poison and all the ugly, itchy painful mess all over my wrist. As I took the bread and the juice, I realized that over 2000 years ago, on a wooden cross, Jesus had done it. For sure, He still does it today. He offers the cure for a sore and blistered heart. The satisfaction for a soul that itches for peace. He offers it freely, if we will only take it. The bread and the juice had special meaning to me today. He is the Antidote for the poison. I am “anonymous” above… Kerry. So this is my 3rd attempt at posting a comment. And yes, it is “Antidote” 🙂 — “a remedy to counteract the effects of poison.” WOW! Wonderful illustration… And I am so grateful for the Antedote.